The Arri Alexa (stylised as ALEXA) is a film-style digital motion picture camera system made by Arri first introduced in April 2010. The camera was Arri's first major transition into digital cinematography after smaller previous efforts such as the Arriflex D-20 and D-21. It features modularity, PL mount lenses, a Super 35 sized CMOS sensor shooting up to 2880×2160 (2K) resolution and supports uncompressed video or proprietary raw (ARRIRAW) data. 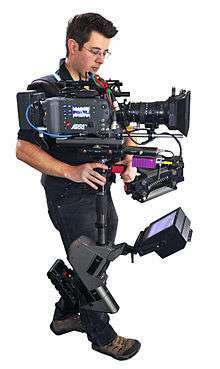 Arri Alexa camera being used with Master Steadicam. The camera has several methods of recording, including SxS cards, CFast 2.0 cards and SXR Capture Drives at resolutions up to 2880 x 2160 pixels in either Rec. 709 or Log-C to ProRes or ARRIRAW codecs. Alexa camera owners can purchase additional software licenses that will unlock different capabilities of the Alexa Camera including High Speed 120fps recording, DNxHD codec and 4:3 "Open Gate" Mode for anamorphic lenses. The camera is designed for use in high budget feature films, television shows, and commercials, and competes with Red Digital Cinema's line of high end cameras such as the Epic Dragon and Weapon Dragon. The first camera of the Alexa product family. The ARRI ALEXA’s CMOS Super-35mm sensor is rated at 2.8K and ISO 800. That sensitivity allows the camera to see a full seven stops of over exposure and another seven stops of underexposure, an unprecedented Dynamic Range. To take advantage of this, ARRI offers both industry-standard REC709 HD video output as well as the Log-C mode that shows the entire range of the chip’s sensitivity, allowing for an extreme range of color correction options in post. The ALEXA Plus added integrated wireless remote control, the ARRI Lens Data System (LDS), additional outputs, lens synchronization for 3D, and built-in position and motion sensors. The ALEXA Plus added integrated wireless remote control, the ARRI Lens Data System (LDS), additional outputs, lens synchronization for 3D, and built-in position and motion sensors and a 4:3 sensor making it ideal for anamorphic cinematography. The Alexa M had its imaging and processing unit broken down in two parts to be small, compact and lightweight for 3D rigs and other uses where size is a concern. The Alexa Studio features an optical viewfinder, mechanical shutter, and a 4:3 sensor for anamorphic cinematography. In February 2013, the range was renewed as Alexa XT (XT standing for extended technology). This range is upgraded versions of the original Alexa cameras, which are equipped with a so-called XR module, which replaces the SxS module on the cameras, and allows direct RAW recording without the need for an external recorder. This module records on dedicated SSD drives. Further improvements are an internal ND filter unit, a 4:3 sensor and a quieter cooling fan. The range accordingly comprises the Alexa, the Alexa XT, the Alexa XT M, the Alexa XT Plus, the Alexa XT Studio, and the Alexa Fiber Remote. Existing cameras can be upgraded with the XR module for internal RAW recording. On 21 September 2014 at the Cinec convention in Munich, Arri announced the Alexa 65, a 6k 65mm digital cinema camera. As with cameras from competitor Panavision, the Alexa 65 camera was available by rental only, provided through the ARRI Rental Group. The Alexa 65 uses the A3X sensor, which has a maximum recordable resolution of 6560x3100. The first production to use the camera was Mission Impossible - Rogue Nation, which was used to shoot the underwater sequence, and around forty percent of The Revenant. Other films where specific sequences were shot with the Alexa 65 include Rogue One: A Star Wars Story, The Huntsman and The Divergent Series: Allegiant. The first feature films to be shot entirely with the camera were Snowden and The Great Wall. In April 2015, it announced that Captain America: Civil War would feature 15 minutes of footage shot using a version of the camera built in collaboration with IMAX. In May 2015, Marvel Studios announced that Avengers: Infinity War and its untitled sequel will be shot entirely with the new camera, marking the first time a full-length theatrical film will be shot entirely with a customized version of Alexa 65 camera, Alexa IMAX. On 24 February 2015 Arri announced the Alexa Mini. It has the same sensor as the other Alexa cameras. It features in-camera recording to CFast 2.0 cards, 200 FPS and 4K UHD in-camera upscaling. On 18 March 2015, Arri announced the SXT line of Arri Alexa cameras which will support in-camera upscaling of Apple ProRes to 4K resolution and Rec. 2020 color space. Arri also announced the SXR module which can upgrade XT, XT Plus, and XT Studio cameras with the SXT features. The Alexa's ALEV III sensor has 3392×2200 effective pixels used for generating an image, 2880×2160 pixels are generally used for recording on the Alexa Studio and M in 4:3 mode, and 2880×1620 pixels are used for recording on the regular Alexa and other models in 16:9 mode, the rest of sensor is used for lookaround in the viewfinder. Alternately the full sensor resolution may be employed in 'Open Gate' mode for resolution demanding situations. Director Robert Tur with an Alexa-Plus camera equipped with an 18 mm Master Prime lens on the set of SIS. The Alexa 65 uses the A3X sensor, which has a 54.12 mm x 25.59 mm active imaging area. It provides up to 6560x3102 'Open Gate' maximum recordable resolution, and is bigger than traditional 65mm film. ArriRaw is a raw codec similar to CinemaDNG that contains unaltered Bayer sensor information, the data stream from the camera can be recorded via T-link with certified recorders like those from Codex Digital or Cineflow. The ArriRaw format (along with the other recordable formats) contains static and dynamic metadata. These are stored in the header of the file and can be extracted with the free web tool metavisor or with the application Meta Extract provided by Arri. Of particular importance for visual effects are the lens metadata, which are stored only when Arri's lens data system (LDS) is supported by the lens used. According to cinematographer Roger Deakins, the Alexa's tonal range, color space and latitude exceed the capabilities of film. "This camera has brought us to a point where digital is simply better", says Deakins. Deakins used the camera to shoot the James Bond film Skyfall. Due to the camera's simplicity of use and high image quality, quite a few network television shows have been shot with the Alexa. ↑ "ARRIRAW | ARRI Digital". Arri. 15 July 2010. Retrieved 7 December 2011. ↑ "ARRI Group: News". Arri.com. Retrieved 2014-02-05. ↑ "ARRI Group: Cameras". Arri.com. Retrieved 2014-02-05. ↑ Renée, V. "Rumor No More: ARRI Reveals Their 6K 65mm Cinema Camera, the ALEXA 65". No Film School. Retrieved 22 September 2014. ↑ "ARRI Rental - ALEXA 65" (Press release). ARRI Rental. Retrieved 30 August 2016. 1 2 Sudhakaran, Sareesh (26 September 2014). "Thoughts on the Arri ALEXA 65 65mm 6K Camera". Wolfcrow.com. Retrieved 30 August 2016. 1 2 Deborah D. McAdams (2015-03-18). "Arri Rolls Out Alexa With 4K ProRes Recording". TVTechnology. Retrieved 2015-03-19. 1 2 "ALEXA SXT". Arri. Retrieved 2015-03-19. ↑ metavisor - Free browser viewer for Arri Raw metadata Archived 18 June 2013 at the Wayback Machine. ↑ American Cinematographer: Time Bandit. The ASC. Retrieved 7 June 2012. Wikimedia Commons has media related to Arri Alexa. Frameline Generator Advanced | FLGA - Free web tool for creating highly customized framelines for the ALEXA and AMIRA family of digital cameras.